June and July were very hot months in North Carolina! We usually brought our lunches to work, but a couple of times, we ate at Milano's Italian Restaurant in Norwood, NC. They don't have a website, but they are located on Main Street, and have a small outdoor seating area for those willing to brave the heat. The food was very good, and the portions were very large -- allow a little extra time or call your order in if you're in a rush. The Eagle's Nest at the Tillery Tradition Country Club was very enjoyable with good food and good service in a surprisingly casual atmosphere. Z Pi Pizza Company in old downtown Albermarle, NC was a favorite with every body! They had an impressive and extensive beer menu, which also featured many North Carolina Craft Beers. One of the co-owners, Edward Hill, made all of us feel welcome on numerous visits to this establishment. 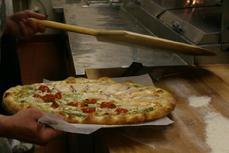 Featuring hand-tossed pizzas with unusual toppings, paninis, and salads, it would be hard not to find something you like on their menu. For those cooler summer evenings, there is patio seating where one can watch passers-by. Z Pi doesn't have a website, but you can follow them at: Z n (on FaceBook). Most evenings found us dining at home, with meals that would make a lot of people envious. There was always something going on the grill! Of course, we were lucky to be working with Max Gardner (of Progress Energy) who is an award-winning BBQ-er! We had an incredible feast one evening, with Max at the helm! We rented two houses that were right next door to each other on Tillery Lake, and found one of them on www.homeaway.com. You can also contact Dave Jackson at djackson.charlotte@gmail.com. We were just a few minutes away from our work site via boat or truck. Pretty much every evening found us cooling off in the lake before starting dinner. It's not enough to weld pipe for 10 hours per day, but we like to use it as a water toy too! One Saturday after work, we drove to the Linville Gorge in the Pisgah National Forest (about 4 hours away from Mt. Gillead), to go rock climbing. The Linville Gorge is considered the "Grand Canyon" of the east, and is over 14 miles long and 2000 feet deep. Some websites to look at for the area are: www.blueridgeheritage.com/attractions-destinations/linville-gorge-and-falls; www.hikingnthesmokies.com/linville_gorge.htm. After leaving the Table Rock parking area, we hiked 3 miles and then descended 1500 feet into the gorge. We climbed The Daddy, which had 5 pitches at a 5.8 variant for a total climb of 5oo feet. Precisely 12 hours later, after the long hike out, we returned to the truck.....We had conquered "The Daddy"! Now for the 4 hour drive home. We ate dinner both coming and going to the Linville Gorge in Morganton, NC. A very quaint and walkable downtown which had a variety of options for diners. What other little free time we had was spent not too far away at the Uwharrie National Forest -- either hiking or mountain biking. The Uwharrie covers a total area of 50,369 acres, with over 30 miles of multi use trails. More information can be found at: http://www.imba.com/blog/chris-bernhardt/new-mountain-bike-trails-uwharrie-national-forest.